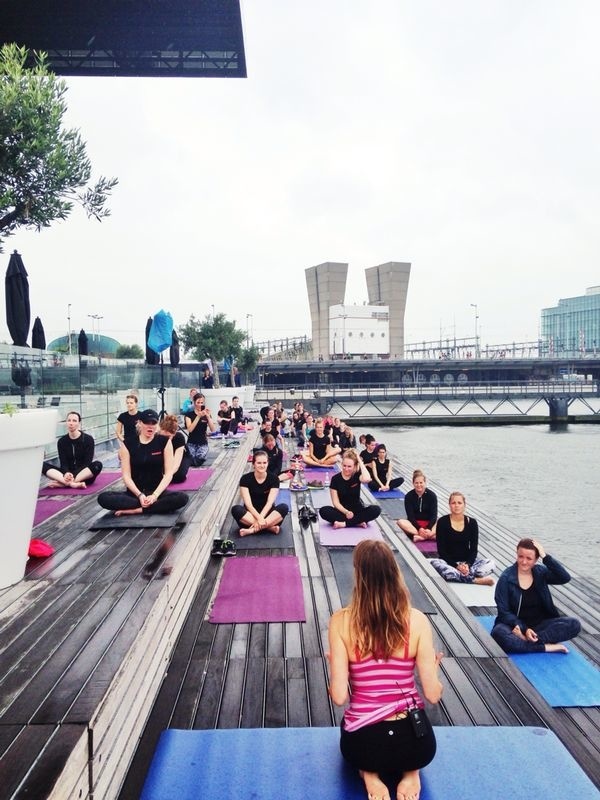 A few weeks ago I taught yoga to 70 women on the beautiful terrace Muziekgebouw het IJ on the shore of the river ‘IJ’. The yoga class was part of Women’s Health Fit For Summer event , an event where healthy and fit women could explore different kinds of movement, including bootcamp, yoga, surfing and paddle boarding. The yoga class was part of a partnership with Lululemon, my favourite brand of technical yoga wear. When it was time to teach my yoga class, the rain came pouring down, the winds blew hard and heavy against the building and our yoga mats were soaked right through and almost blew away. I hadn’t planned on teaching yoga to 70 yogis in dark and stormy weather on slippery yoga mats, so I decided to change my class plan and theme right on the spot. Most people were new to yoga and I wanted to give them an experience that was accessible and fun and they wouldn’t easily forget. My theme for the class was: “Can you still find balance when faced with all the elements?” I emphasised that yoga is not about getting into the poses but about the attitude we have towards ourselves and the ability to be in the present moment. Balancing poses can often make people feel frustrated, but the wobbling and falling out of a posture is part of the practice. It’s your attitude that matters. How do you respond when you fall out of posture? Do you give up or do try to get back in? Can you laugh at yourself for trying or do you get frustrated and even become mad at yourself? Do you judge yourself or can you be in the moment, try again and let go of your expectations? Yoga is regular practice over time with devotion and, in yoga, there’s no such thing as perfection. If you don’t manage to get up into a pose or fall out, that’s ok too. We all start somewhere. It doesn’t mean you’ll never be able to do the pose. Stay curious, adjust your attitude, let go, keep trying, keep wobbling, keep exploring! That’s how you learn, that’s yoga. I had a great time teaching at Women’s Health Fit For Summer event ,and, despite the weather, the girls really seemed to enjoy the yoga class and I even inspired some to try yoga at home or in a studio. One girl wrote up on our blog that she felt really relaxed after the yoga class. Another girl wrote that she had never finished a yoga class before because she felt she wasn’t flexible eniough and found it really hard to stay focused during a class. She had given up on yoga but this time she managed to stay focused, was able to do most of the poses and even became a fan! I love spreading the spirit of yoga and I believe the world would be a better place if we had more yogis in it. You can find the photos of the event here and here’s a nice video of the event!